I arrived in L.A. last night. The wife has been here for about three weeks already, spending time with family. It was the longest time we've been apart. Absence really does make the heart grow fonder. At first, my newfound independence was refreshing. I had more time to catch up with friends. I didn't have to consider another person's Netflix preferences. But then you start missing this person that's with you everyday. You miss the daily mannerisms and habits, basic things like flossing together. You miss being around your soulmate, because your soul is not a switch that can be easily turned on and off. Having the bed all to yourself gets old. Quick. Here in L.A., I get to see my second nephew, the first on my wife's side of the family. He was born two weeks ago, and he already has a multitude of facial expressions. Seeing a human being in the early stages really makes me appreciate how much of a miracle it is that we're alive on this crazy planet. We breath in oxygen, breath out carbon dioxide, blink our eyes - all without trying. That's a miracle. Seeing my second nephew reminds me of the day my first nephew came into the world - almost two and a half years ago. He was in an incubator. I was watching him through the glass window. I wondered how he felt about being outside the womb. I wondered if it made him angry or scared or relieved. Life is pretty crazy. L.A. is pretty crazy too. 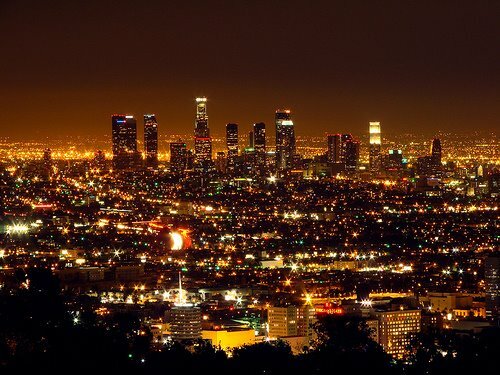 I don't see it so much as the City of Angels, but more like a county of angels. Life's necessities and luxuries, arranged in strip mall format for your convenience. One strip mall after another. Like the suburbs - sprawled across miles and miles. Nothing like the Manhattan experience that has become a part of who I am. Here in L.A., it's comfortable. Of course that's not a totally accurate statement, because I'm not going into work here. I'm not up against deadlines. And no one ever described L.A. traffic as comfortable. Still, my demeanor is different here than in New York City. As much as New York City can drive me nuts sometimes, I like that it keeps me on edge. The energy moves like invisible waves through streets, subway cars and elevators. And you kinda just move along with it to some extent, whether you like it or not. Rubbing shoulders with over eight million people, I'm also constantly reminded that there's more to life than me. But in L.A., I don't know if I get that. People are spread out here. In L.A., I also tend to let down my guard. The word languid comes to mind. I think the comfort factor - dictated through weather patterns and pace of life - just makes it easier for me to get inwardly focused. And that's good and bad. Good because I think L.A. may actually be more conducive to being reflective and deep here compared to NYC. There's less noise. But it's bad because out here, I just may never get beyond wanting to live a life of beach bumming and In-N-Out burger-noshing. And that scares the hell out of me. If I ever moved out here, I would have to fight the urge to be comfortable. I also have two movies set in L.A. to further reinforce my stereotypes of this place: The Big Lebowski and Crash. "The Big Lebowski" comically reminds me what happens when you let a life of complacency set in. "Crash" had one of the most thought-provoking lines I've heard in a while from a movie character. Don Cheadle's character waxes poetic nicely here: "In any real city, you walk, you know? You brush past people, people bump into you. In L.A., nobody touches you. We're always behind this metal and glass. I think we miss that touch so much, that we crash into each other, just so we can feel something."